Decarboxylation refers to the process of removal of CO2 from the molecules having -COOH group. Saturated monocarboxylic acid salt of sodium potassium on dry distillation with soda lime gives alkane. The alkane formed by decarboxylation process always contains one carbon atom less than the original acid.The yield is good in case of lower members but poor for higher members. Soda lime is prepared by soaking quick lime CaO in caustic soda solution and then drying the products. It is generally written as NaOH + CaO. Its reaction is milder than caustic soda. Otherwise the reaction will occur violently. Also CaO used alongwith NaOH keeps it dry (NaOH is hygroscopic) to aid fusion. The decarboxylation of sodium formate yields H2. In wourtz reaction  a solution of alkyl halide in ether on heating with sodium gives alkane. An alkyl halide on Wurtz reaction leads to the formation of symmetrical alkane having an even number of carbon atoms. Two different alkyl halides, on Wurtz reaction give all possible alkanes. The separation of mixture into individual members is not easy because their boiling points are near to each other and thus Wurtz reaction is not suitable for the synthesis of alkanes containing odd number of carbon atoms. When  Zn is used in Wurtz reaction  in place of Na, the reaction is named as Frankland method. The mechanism of Wurtz reaction is although not clear however two mechanisms are proposed for this reaction. Alkyl halides can also be reduced catalytically to alkane by H2/Pd or LiAIH4 or by H2/Ni. The yields are generally high and the hydrocarbons formed are pure. Note : Zn-Cu couple is prepared by adding Zn granules in aqueous CuSO4 solution where copper is deposited on the Zn pieces. Catalyst Ni is used in finely divided form. If Pt or Pd are used as catalyst, reaction occurs at normal temperature. Also some times Raney nickel is used as catalyst. It is obtained by boiling Ni-AI alloy with NaOH, when AI dissolves leaving Ni in finely divided state. The filtered, washed and died Ni is known as Raney Nickel. Raney Ni is effective at room temperature and atmospheric pressure. Electrolysis of an acid salt gives symmetrical alkane. However, in case of mixture of carboxylic acid salts, all probable alkanes are formed. (R1-R1 and R2-R2 are also formed). Alkyl or aryl magnesium halide (R-MgX) are also called Grignard reagents or organometallic compounds.Grignard reagent on double decomposition with water or with other compounds having active H(the hydrogen attached on O, N, F or triple bonded carbon atom are known as active hydrogen) give alkane. 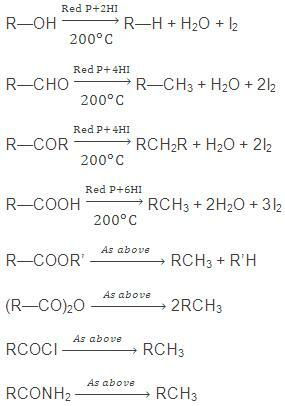 The reduction of either of the above in presence of red P & HI gives corresponding alkane. The reduction of carbonyl compounds by amalgamated zinc and conc. HCI also yields alkanes. This is Clemmensen reduction. Only CH4 can be obtained by the hydrolysis of Be or Al carbides. 1. Calcium carbide reacts with water to give acetylene. 2. Magnesium carbide, Mg2C2 reacts with water to give propyne. Alkenes on hydroboration give trialkyl borane as a result of addition of diborane on olefinic bond. This trialkyl borane on treatment with acetic acid or propanoic acid yields alkane. Alkyl chloride say chloroethane reacts with lithium in presence of ether to give lithium alkyl then reacts with CuI to give lithium dialkyl cuprate. This lithium dialkyl cuprate now again reacts with alkyl chloride to given alkane.